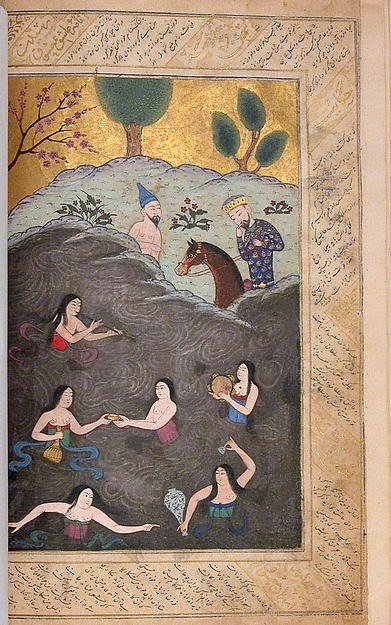 This is another example of a Persian poetry manuscript. It is kept in Metro Museum in New York City. I strongly believe it is about a poem by Nizami due to the form of the image since is similar to the ones about Alexander Watching the Sirens. As a result, I think this page belongs to Eskandar-nameh (Persian: اسکندرنامه) "The Book of Alexander". There is a similar item in David Museum in Denmark. According to the museum, this manuscript was first copied in Shiraz in 1411 during the governorship of Iskandar Sultan, grandson of Timur and a great patron of the arts, particularly the arts of the book. Spaces for miniatures elsewhere in the volume were left blank and subsequently filled in by Turkman Aq Quyunlu and Ottoman painters, providing a chronicle for the manuscript's travels. The fine Nasta'liq is from the hand of a celebrated scribe who was responsible for a number of Shiraz manuscripts dating between 1405 and 1429.